Dusty ruby black color. Savory aromas of fig jam, quince paste, smoked meats, and cherry mostarda with a round, vibrant, fruity medium-to-full body and a sleek, nuanced, medium-long paprika, chocolate dipped berries, toasty sandalwood, and vanilla finish with well-integrated, medium tannins and moderate oak flavor. An elegant, nuanced Merlot with savory spice and intriguing fruit; old-world flair abounds in this East coast charmer. Bottom Line: An elegant, nuanced Merlot with savory spice and intriguing fruit; old-world flair abounds in this East coast charmer. 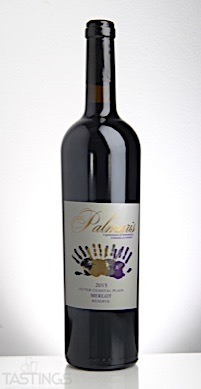 92 • Palmaris 2013 Reserve, Cabernet Sauvignon, Outer Coastal Plain 13.7% (USA) $40.00. 84 • Palmaris 2014 Reserve, Chardonnay, Outer Coastal Plain 12% (USA) $25.00. 86 • Palmaris 2013 Reserve, Cabernet Franc, Outer Coastal Plain 13.1% (USA) $40.00. 84 • Palmaris 2015 Reserve, Pinot Noir, Outer Coastal Plain 12.65% (USA) $25.00. 87 • Palmaris 2014 Reserve, Cabernet Sauvignon, Outer Coastal Plain 12.6% (USA) $30.95. 88 • Tomasello 2013 Cabernet Sauvignon, Outer Coastal Plain 13.8% (USA) $29.95. 92 • Tomasello 2013 Estate, Blaufrankisch, Outer Coastal Plain 11.8% (USA) $18.95. 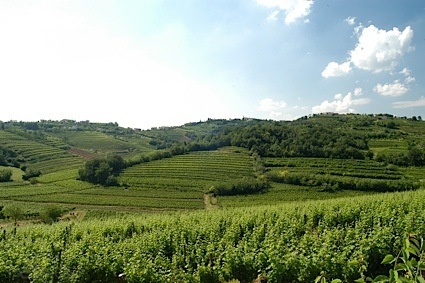 87 • Tomasello 2014 Sangiovese, Outer Coastal Plain 13.4% (USA) $18.95. 86 • Tomasello 2015 Rkatsiteli, Outer Coastal Plain 12.2% (USA) $15.95. 91 • Tomasello 2015 Palmaris Estate Reserve, Merlot, Outer Coastal Plain 13.9% (USA) $24.95. 88 • Tomasello 2014 Palmaris Estate Reserve, Cabernet Sauvignon, Outer Coastal Plain 12.6% (USA) $30.00. 84 • Tomasello 2015 Palmaris Reserve, Chardonnay, Outer Coastal Plain 13.1% (USA) $25.00. 87 • Tomasello 2013 Palmaris Reserve, Cabernet Franc, Outer Coastal Plain 13.1% (USA) $40.00. 93 • Tomasello 2014 Palmaris Reserve, Petit Verdot, Outer Coastal Plain 12.5% (USA) $30.95. 90 • Tomasello 2015 Sangiovese, Outer Coastal Plain 13.3% (USA) $18.95. 93 • Tomasello NV Red Raspberry Wine 11% (USA) $12.95. 89 • Tomasello NV Cherry Wine 9% (USA) $12.95. 91 • Tomasello NV Blueberry Wine 11% (USA) $12.95. 94 • Tomasello NV Cranberry Wine 9% (USA) $12.95. 88 • Tomasello NV Pomegranate Wine 10% (USA) $12.95. 86 • Tomasello NV Blueberry Forte 18% (USA) $12.95. 92 • Tomasello NV Red Raspberry Moscato 6.5% (USA) $13.95. 90 • Tomasello NV Cherry Moscato 6.5% (USA) $13.95. 88 • Tomasello NV Blueberry Moscato 6.5% (USA) $13.95. 92 • Tomasello NV Cranberry Moscato 6.5% (USA) $13.95. 88 • Tomasello 2015 Ice Wine, Vidal Blanc, Atlantic County 13.7% (USA) $28.00. 88 • Tomasello NV Blackberry Moscato, New Jersey 6.5% (USA) $13.95. Tomasello 2015 Palmaris Estate Reserve, Merlot, Outer Coastal Plain rating was calculated by tastings.com to be 91 points out of 100 on 1/18/2018. Please note that MSRP may have changed since the date of our review.